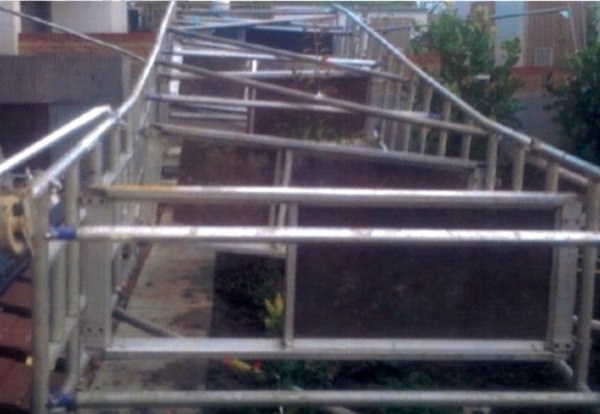 A Croydon contractor has been prosecuted after a worker fell eight metres from a scaffold tower he didn’t want to build because it was on unstable ground. Green Acre Homes (South East) Ltd failed to listen to the concerns raised by handyman John Morgan, who had been instructed to build a tower scaffold on a site in Peckham. Morgan, 44, of Roehampton, was finishing building the top of the tower on November 25 2009 when a strong gust of wind sent it crashing to the ground. He plummeted eight metres, fracturing his ribs and breastbone, compressing his vertebrae and wounding his head. Westminster Magistrates’ Court heard that Morgan and a colleague were initially asked to erect the tower scaffold in an area that didn’t provide a stable base. Despite protesting to site management they were told to continue. They improvised as best they could until a representative from Wandle Housing Association, the client company, saw it and ordered the tower to be taken down as it was unsafe to use. The court heard Morgan was then told to build the tower in a second location. Again there was a space problem and again he and his co-worker raised concerns with managers about safety. As it was nearing completion, Morgan was at the top of the tower when high winds struck, sending the tower toppling to the ground. Green Acre Homes has since gone into liquidation but the HSE pursued the case to send out a message to the industry. The firm did not turn up in court and were found guilty in their absence. It was fined £15,999 and ordered to pay costs of £6,909. After the hearing, HSE Inspector Ian Seabrook said: “Mr Morgan was lucky to have survived this fall. He and his colleague had tried several times to convince managers that a tower scaffold could not be safety erected where they had been told to put it. In addition neither of them was trained to construct scaffold towers. “Even after the firm’s client company had ordered the first one to be dismantled, they ignored the very valid concerns repeated by the two handymen, even when their fears were echoed by other workers on site.